Dungeons & Dragons makes ability checks a key part of play, but these checks took years to enter the game. How did ability checks advance from house rule, to optional rule, to a foundation of fifth-edition D&D? Before D&D added ability checks, players found a style that mostly avoided a need for such rolls. See A Lack of Ability Checks Shaped How People Originally Played Dungeons & Dragons. Even so, characters tried things that the rules didn’t cover. For many of these actions, success or failure hinged on a character’s ability scores. Gary Gygax told dungeon masters to guess the odds of success and roll for it. But DMs and players wanted more consistency and less guessing. 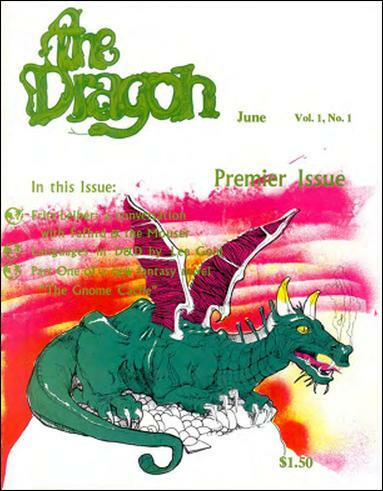 In 1976, issue 1 of The Dragon printed “How to Use Non-Prime-Requisite Character Attributes” by Wesley D. Ives. The article proposes a sort of ability check before anyone coined a name for it. This first ability check suffers from a mechanic so baroque that it reads like a gag. Roll d100, add the ability score, and then use this result to determine which die to roll in step 2. On a result of 1-20 roll a d4; on 21-40 roll d6; on 41-60 roll d8; 61-80: d10; 81-100: d12. To cope with results higher than 100, create a house rule for this house rule. Roll the die determined in step 1 and multiply the number by the attribute. This result becomes the chance of success. Roll a d100. If the result is less than or equal to the probability from step 2, you succeed! The method requires three rolls, multiplication of double-digit numbers, and a table. But if that seems too simple, the article offers optional rules accounting for character level and class. All this yields an outcome barely more realistic than a coin flip. To settle on an ability-check mechanic that required so much fuss, the author must have seen checks as a rare undertaking. Despite the tortured mechanic, the idea of ability check marks a major innovation. None of the few role-playing games available in 1976 featured anything like the concept. In a few years, every RPG would build on the idea. By the late 70s, the method found in the Dig spell turned into common house rule: To make an ability check, players tried to roll under an attribute on a d20. Meanwhile, other role playing games advanced the state of the art. Traveller (1977) introduced skills and a single mechanic for skill checks. Runequest (1978) boasted skills and “attribute rolls” that multiplied an ability by 5 to set a percentage chance of success. In games with skills, the skills cover most tasks a player might attempt, so ability checks blur into skill checks. Fifth edition intentionally makes skills an addition to ability checks. As for skills, Gygax preferred to keep D&D’s class archetypes pure. His Unearthed Arcana (1985) added weapon proficiencies as a sort of weapon skill, but the narrow scope kept the sharp lines between classes. Oriental Adventures (1985) extended the concept to create non-weapon proficiencies—skills without the name. These new proficiencies never overlapped with class abilities. After Gary left TSR in 1985, his successors on the AD&D team lacked the clout to make sweeping changes to the company’s flagship game. Nonetheless, their additions inched AD&D closer to matching the ability checks and skills in other role-playing games. Ability checks finally reached AD&D in the Dungeoneer’s Survival Guide (1986). 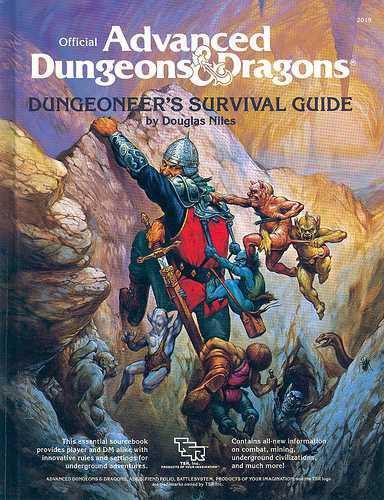 Although this book’s title suggests a focus on player strategy, this guide brought key rules innovations to AD&D. Here, the non-weapon proficiencies from Oriental Adventures became options in the primary game. When players used non-weapon proficiencies, they made proficiency checks to determine the outcome. These checks operated like ability checks, but proficiency improved the chance of success. Class abilities already covered most of a character’s actions, so non-weapon proficiencies rarely came up in play. The phrase “non-weapon proficiency” proved unwieldy. The term evolved from Gary’s own work on D&D, but it forced a lot of extra syllables on players just to avoid contaminating D&D with anything called skills. Roll-under ability checks confused players and designers. For D&D’s other d20 rolls, players aimed high, but for ability checks they aimed low. This simple difference fostered confusion. The original ability-check rule said, “The DM may give a bonus or penalty to the roll depending on the difficulty of the action.” That meant a bonus subtracted from the roll—an ugly break from intuition. A cleaner method adds the bonus to the attribute, so players roll under a higher number. By now, some Internet critics might scoff at my notion that adding roll-under checks to D&D confused people. I imagine an argument heaping contempt on idiots who clearly lack the intellectual capacity for RPGs. Go back to Candyland. Who would let roll-under checks trip them up? The D&D team at TSR. Sometime during playtesting, the Dungeoneer’s Survival Guide apparently switched its method of applying modifiers, but the book reached print with an incomplete change. The “Sage Advice” column in Dragon issue 118 tried to sort out the mess. “OK, OK, OK, already! You’re right—there is something wrong with the DSG non-weapon proficiency system. TSR management insisted that second edition AD&D remain broadly compatible with the original. The Player’s Handbook (1989) included a corrected version of non-weapon proficiencies as an optional rule. Ability checks entered the core game, but languished in the glossary. For D&D’s third edition in 2000, the designers finally gained leeway to correct old drawbacks. Ability checks flipped so players aimed for high rolls. Skills embraced the actions characters actually did in the game. And no one had to say or type “non-weapon proficiency” ever again (unless they tell this story). This entry was posted in Role-playing game history and tagged ability checks, Dragon magazine, Dungeoneer's Survival Guide, Gary Gygax, Oriental Adventures, Player's Handbook, Runequest, Tom Moldvay, Traveller, Unearthed Arcana. Bookmark the permalink. I prefer roll equal or under for ability checks: every stat point matters, you can apply mods, you can use “great success” as roll under half/terrible failure as roll x1.5, players know rough odds of success up front, and GM rulings such as “str 16 auto does it, eveyone else roll” are a natural extension. Low Fantasy Gaming rpg uses this method, for example. I think the more abstract DCs, primarily to accommodate roll high, was a step backwards. There is an interesting give-and-take here between the freedom of early play and the current methods. Early play’s lack of rules freed up the player to just imagine whatever they wanted to do. “I want to try to fish for food,” says the excited player. Back then, however, the DM might simply say, “you can’t.” Or, the DM might very likely draw from either percentile dice or the method for secret doors. “I give you a 10% chance you catch a fish” or “roll a d6, on a 1-2 you catch a fish.” The odds were probably completely arbitrary (and varied wildly from DM to DM and even session to session) and the DM was just as likely to roll as the player. I think this probably leaned towards cementing the DM as a judge, and often one that leaned towards saying no. I suspect the current rules with skills and ability checks provides more player empowerment due to the player having solid expectations. A Survival skill check will likely be used to fish. The player might just say, “I want to make a Survival check to fish for food… what is the DC?” and the DM will be bound by 5E’s suggestions on DCs. At the same time, the use of skill lists is a shackle of sorts, funneling the many things a player can do into these skills and probably stymieing creativity. One of the things I miss from the D&D Next playtests was that brief era where the focus was on ability checks over skills. While I love 3E’s ability to customize a player through skills, the early playtest really separated skills from ability scores and allowed greater flexibility. It was great for creativity on both sides. Either DM or player could call for the badly needed Strength (Intimidation) check, or any other combination. Make me a Dexterity (Arcana) check as you try to disable the magical trap, and a Charisma (Acrobatics) check as you juggle to impress the Queen. It reminds me of the great skill-attribute combinations you could get with Legend of the Five Rings. Alas, the final version of 5E is so iron-clad that we hardly see deviation. Writing for official material, we always say “Intelligence (Investigation) check,” as if there were any wide use of some variant for Investigation in current play. There isn’t, but it would be cool if it happened more often. I am not sure what exactly you see as “iron-clad” in 5E but a DM always has the option to ask for a different Ability or skill check than what is suggested in the PHB. If you believe that Charisma is the more appropriate skill to use when trying to impress the Queen as you juggle, Charisma is what you should ask for. Players proficient in Acrobatics get to add their Proficiency bonus to that roll. Simple! Same with Dexterity (Arcana) for that magic trap or Strength (Intimidation) or Wisdom (Investigation) or anything else. Just because a ruling is placed behind a little word called “Optional” doesn’t make it wrong or unusable. If people were not so afraid of “moving beyond the established norm” the world would be a better place. We don’t need to put such limits to our RPGs too! After all of the rolls, the end result is virtually indistinguishable from rolling your ability score or less on a d20. Very nice, Dave! TSR getting confused about low is good? That is something that I never knew! I like the mechanic, dice that always seem to roll high are typically unbalanced, and this system punishes them. The most confusing mechanic at my table is the Saving Throw table, everybody always forgets if you aim high or low, including me. I find myself looking at the chart just to figure it out almost every time. I have no idea why that is. It’s worth noting that as of at least 1991, Aaron Allston called them “Skills” in the collected “D&D Rules Cyclopedia” from TSR.